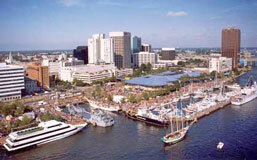 Portsmouth, Virginia is a historic city on the Elizabeth River. 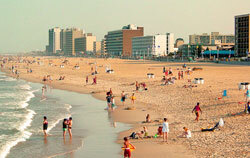 Many of the finest attractions in the city are clustered within walking distance of one another in Olde Towne. This neighborhood features a scenic waterfront, upscale dining, a plethora of antique and boutique shops, and a large collection of historic homes. 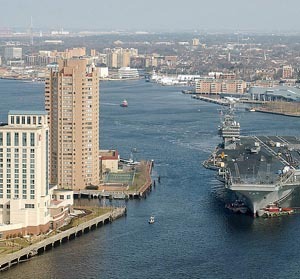 Portsmouth VA is directly across the river from downtown Norfolk. A quick and inexpensive pedestrian ferry operates between the two cities. The Renaissance Portsmouth Hotel is a four-star full-service hotel and conference center located on the waterfront of Portsmouth, Virginia. 249 guestrooms, including a Presidential Suite. Every room has a water view. Concierge Level and Lounge with keyed elevator access. Other amenities include a living-room style club room lounge with a waterfront view and an indoor pool with a outdoor sun deck. The Comfort Inn Olde Town provides everything you'd expect from a property in the Comfort Inn chain of hotels including continental breakfast and free morning paper. Many of the finest attractions in the city of Portsmouth, Virginia, are clustered within walking distance of one another in Olde Towne. This neighborhood features a scenic waterfront, upscale dining, a plethora of antique and boutique shops, and the largest collection of historic homes between Alexandria, VA, and Charleston, SC. Pick up the Olde Towne Walking Tour Map from the Visitor Center at 6 Crawford Parkway. The Naval Shipyard Museum presents the history of America's oldest and largest naval shipyard, which is located on the Portsmouth waterfront. Founded in 1767, it's been burned 3 times by retreating armies because of its strategic importance. Historic ships have been built here, including the first ironclad to engage in battle, the nation's first battleship, and the world's first aircraft carrier. The Children's Museum of Virginia has over 90 hands-on exhibits for kids of all ages, including an awesome toy train collection and a planetarium. Your ticket to some truly amazing places and enlightening discoveries.